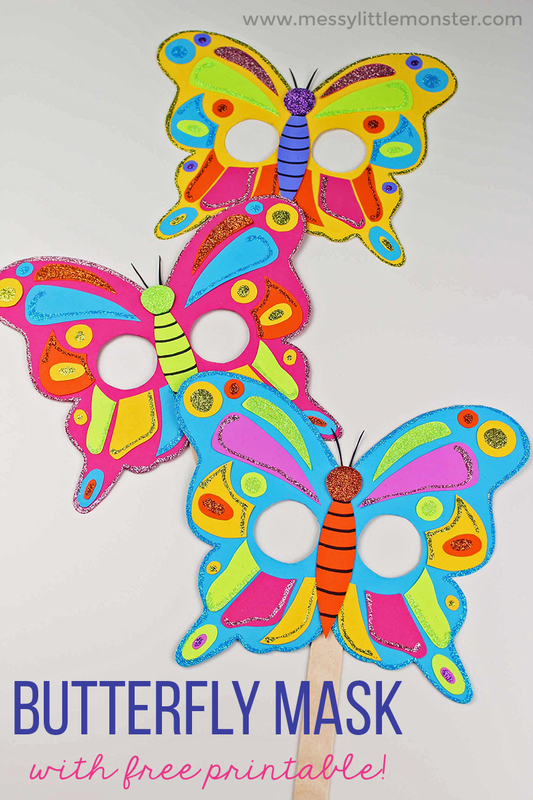 This Butterfly Mask craft is perfect for toddlers and preschoolers. We have included a free printable butterfly mask template so it is really easy for kids to have fun making this butterfly craft. 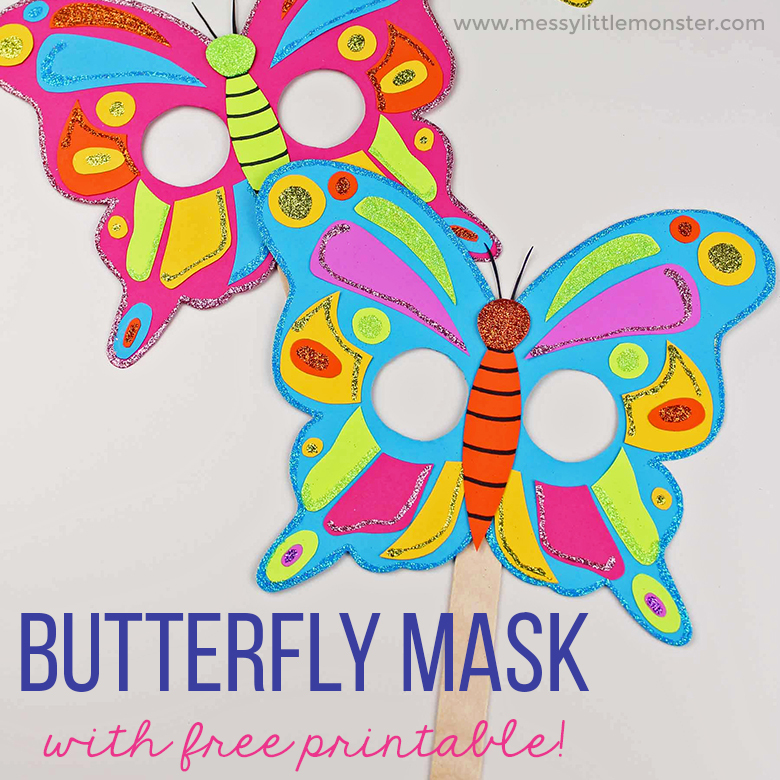 Just download and print the butterfly printable and follow the easy step by step instructions to make this beautiful butterfly mask! 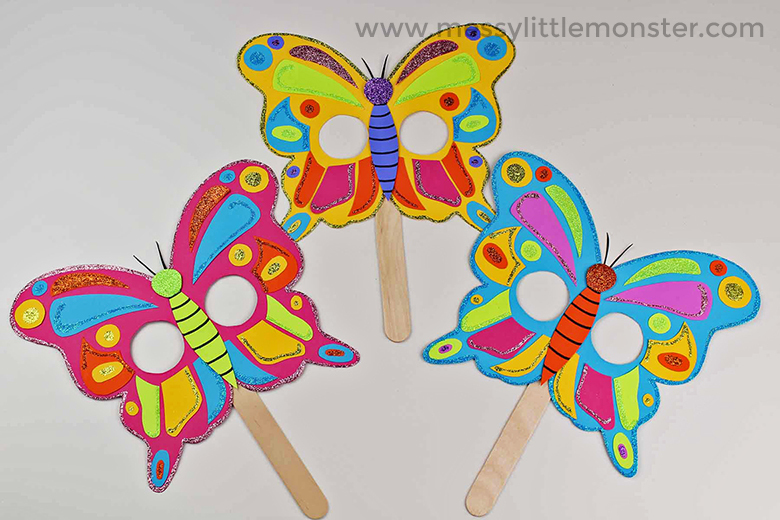 Are you looking for more fun butterfly crafts and activities that your little toddlers and preschoolers will love? Try this butterfly ring dish or rainbow footprint butterfly. If you're looking for another butterfly printable, your toddler or preschooler will love our bug and butterfly colouring pages or coloring in the butterfly on our free printable, i is for insect coloring page! Below you will find simple step by step instructions to show you how to make this butterfly mask with our free printable butterfly mask template! 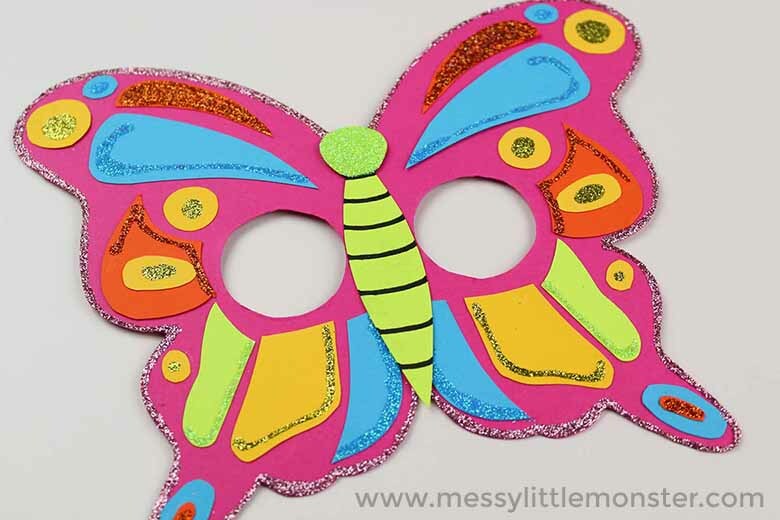 This butterfly mask would be so much fun for toddlers and preschoolers to make at a party or on a playdate. 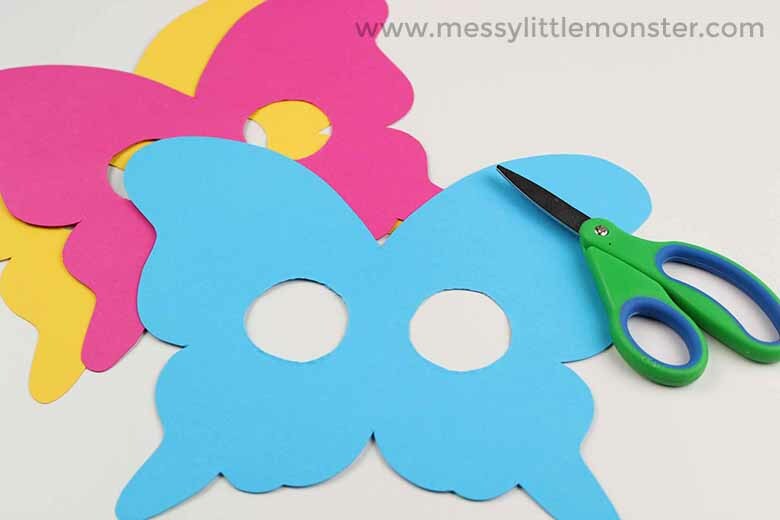 The butterfly printable makes it a fun and easy craft. SCROLL DOWN FOR THE FREE PRINTABLE BUTTERFLY MASK TEMPLATE! First things, first - gather up your supplies for your butterfly mask! This makes things so much easier, especially when you're having fun doing crafts with toddlers and preschoolers. Make sure you print and download your free printable butterfly mask template. You can find your butterfly printable by scrolling down below. Now that you have your supplies all gathered up, it's time to get tracing and cutting! The first part of the butterfly mask we are going to focus on is the main butterfly shape. First, cut the butterfly and eye holes out from the butterfly mask template and then trace around it onto coloured cardstock. 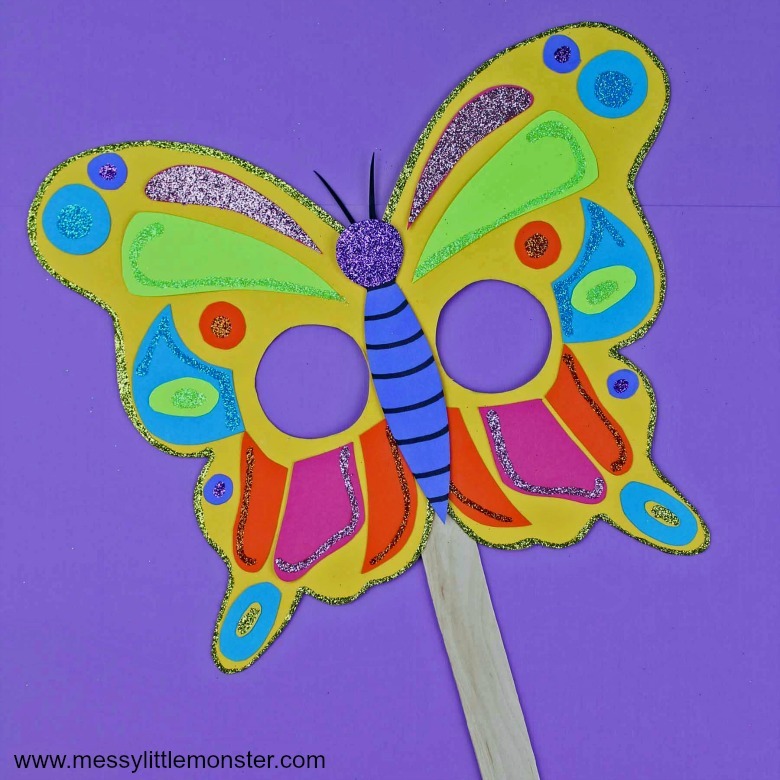 You can make the butterfly mask any colour that your toddler or preschooler chooses. I personally love the hot pink butterfly! 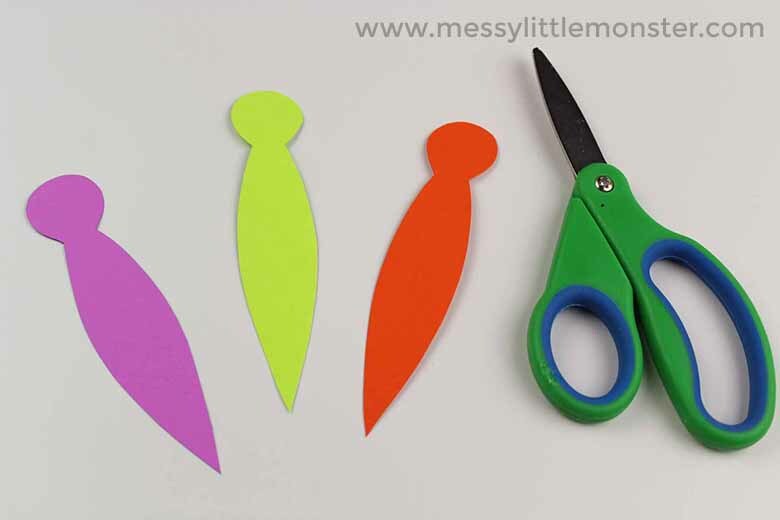 If you are doing this activity with young children an adult will have to prepare this part of the butterfly craft in advance. Whilst older kids will be able to do this stage themselves, they may still need a little help cutting out the eye holes. We are now going to set this part of our butterfly mask aside until later. Next, we are going to focus on the body of the butterfly. Trace the body onto cardstock in the colour of your choice and cut it out. Older preschoolers may be able to help with the cutting in this step. It's great cutting practice without being too complicated for them. Set the body of the butterfly aside until we need it later. 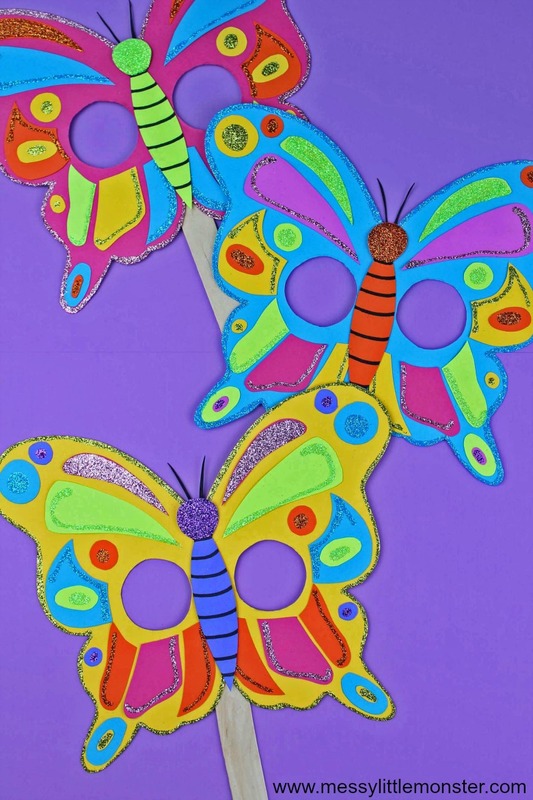 The next part of this butterfly craft is where the fun and creativity begins! There are a few ways that you can decorate this butterfly mask. You can either trace the shapes from your free printable butterfly mask template onto cardstock and cut them out. Once you've done that young children can glue them onto the butterfly mask in any way they choose. They can then have fun decorating by adding lines of glue to the shapes and sprinkling glitter on them. 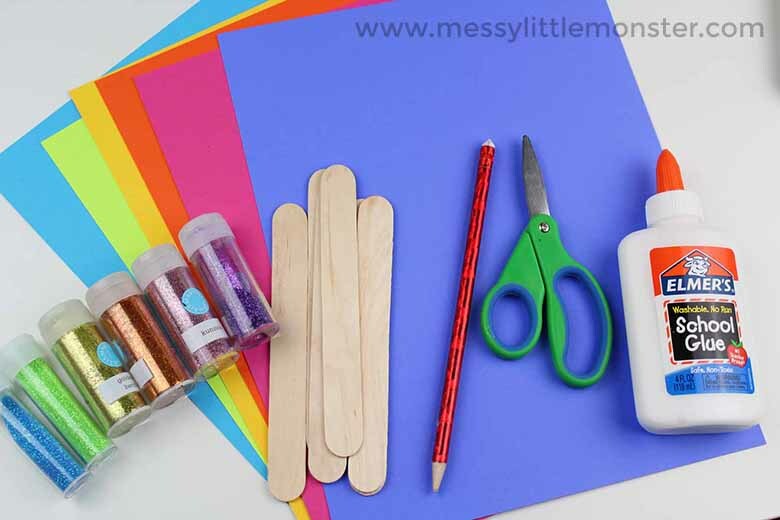 Alternatively (and my prefered way of doing this butterfly activity), just let the kids loose with pens, paint, crayons, sequins and glitter and see what they come up with! Kids are so creative when they are given the opportunity to be. Now it's time to add the body of the butterfly to your butterfly mask! You may wish to add horizontal lines across the body of your butterfly and some glitter to the head like in the images, or your toddler or preschooler may have other ideas! You're now ready to glue the body onto your beautiful butterfly mask. We're almost done with our beautiful butterfly mask! The next part will serve as the "feelers" of your butterfly. Cut out very thin pieces of black cardstock and glue them behind the head. You'll want to assist your toddlers and preschoolers as this can be a little tricky. Now that your mask is all complete, it's time to add it to your popsicle sticks! 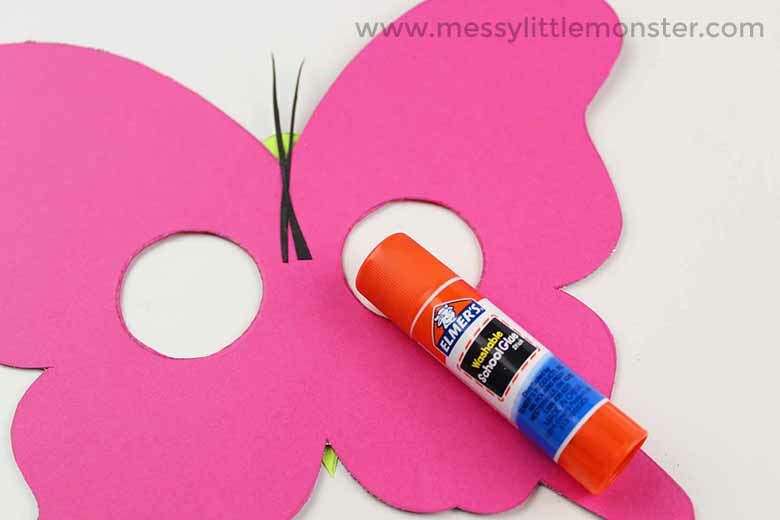 Using a hot glue gun, glue the popsicle stick to the bottom of the back of the butterfly mask. 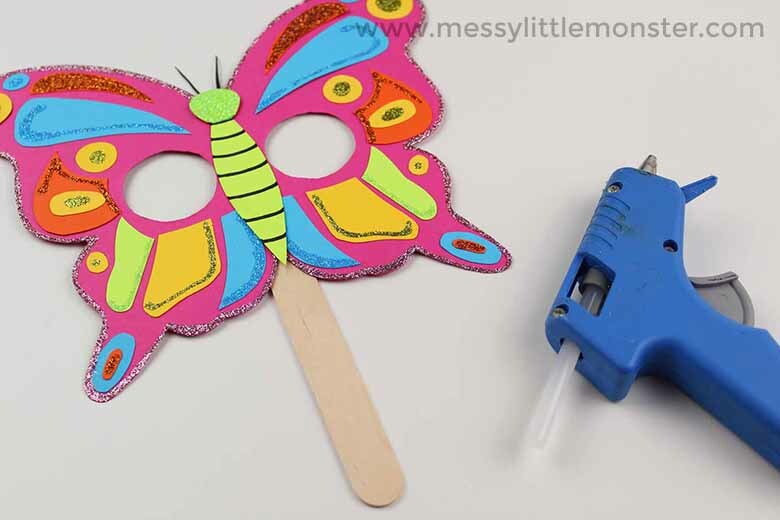 If you are doing this butterfly craft with a group of children in a toddler group or school it may be better to add the popsicle stick using tape rather than having a hot glue gun near young children. Another idea is to add string or ribbon to the butterfly mask instead so that you can tie it in place. That's all there is to it! You're done with your butterfly mask craft! This would make such a fun activity for a party or playdate. To download this printable butterfly mask for free add $0 and click on the 'I want this' box below. It may take a moment for the page to load so please be patient. If you enjoyed this butterfly mask, you'll also love these other fun butterfly crafts and activities! Your toddlers and preschoolers will have so much fun making this butterfly ring dish or rainbow footprint butterfly. They'll especially love coloring in the butterfly on our free printable, i is for insect coloring page! Your toddlers and preschoolers will love running around the house with their new butterfly mask, pretending to be a beautiful butterfly! Pretend play is so much fun with this age group. This is a great activity for young children to enjoy with their friends at parties and playdates. 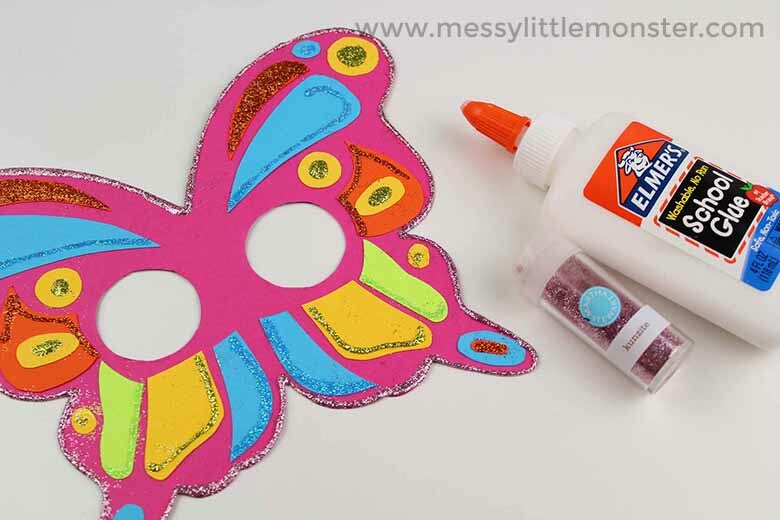 This fun butterfly mask craft is something that they can enjoy for many hours after the activity is done. The free printable butterfly template makes this craft so easy!